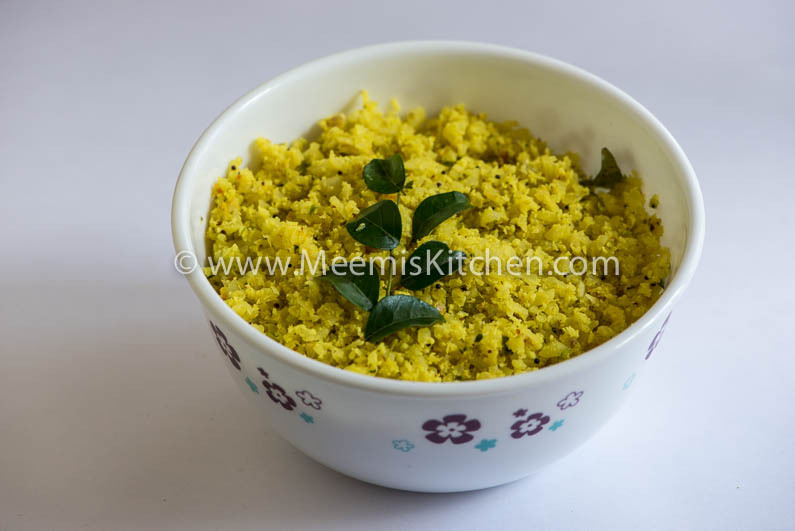 Papaya Thoran is a great vegetable side dish for rice in Kerala. Kerala is blessed with Papaya trees, with almost all houses in village areas having one or two in their backyard. Papaya is a wonder fruit and whether unripe, semi ripe or ripe it has many health benefits. Ripe Papaya is packed with nutrients and is good for heart, diabetics and also aids digestion. Green Unripe Papaya is also loaded with essential nutrients and minerals and is a healthy food (see health benefits below) for kids and adults. My mom used to make unripe papaya thoran and papaya moru curry regularly, as she thought it was good for us, as it clears intestinal worms. Papaya thoran is some vegetable she never forced us to eat during our childhood, as it tasted better than cabbage (of course, Cabbage Irachi thoran was an exception) or any other vegetable. Really, I was a fussy vegetable eater when I was young and looking back I don’t know how I could miss all the wonder veggies. Pavakka was another favourite vegetable, Pavakka fry, Pavakka thoran, Pavakka theeyal, pavakka pickle all were my favourites. Now, my kids are following the suit and I can’t complain! Hope when they get older they will also change like me. Well, coming back to papaya thoran, it is simple and delicious so make this healthy food a regular item for your lunch menu. Try this wonderful combination : Rice paired with Papaya Thoran, Kovakka fry, Kaya or Koorkka Mezhukkupuratti, Kottayam Fish Curry or Beef Kaya curry or Beef fry, and Kumbalanga Pulissery. For vegetarians , the combo would be Papapya thoran, Ulli theeyal and Achinga mezhukkupuratti with some papad or Kovakka fry. It is the perfect home lunch!! Wash and peel the green skin of Papaya, remove the seeds and clean the inside part and wash and chop very finely (I advise you all to buy a small chopper, it certainly is helpful for those who have less time). Coarsely grind the coconut, chilies, onion, curry leaves and turmeric. Heat oil (coconut) and pop mustards and some curry leaves. Add the papaya, put enough salt; stir and cover and cook on low flame, stirring in between. Once the papaya is cooked add the coconut mix and stir well. Cover and cook for another minute. Papaya Thoran is ready. It is really simple. The only thing is about chopping, and for that I have given you suggestion. Mini Chopper does not cost much and there are several brands available. No need to use water while cooking. Just stir in between. One medium Papaya is too much for a small family. So keep half of the Thoran in the fridge for next day. Adjust the coconut ratio as per the volume of the chopped Papaya. Papaya contains essential nutrients and minerals like potassium, magnesium, and vitamins like A, C, B and E.
Green unripe papayas aid digestion, converts proteins into essential amino acids, cleanses the colon, fights nausea and constipation to name a few. Have a great healthy lunch with Papaya Thoran, Pavakka Varuthathu, Fish curry. God Bless! !